Early in April 1951 and an LUT Feltham No 2133 trundles across the West Croydon "Crossing" into North End with curiously Croydon as its destination rather than Purley. 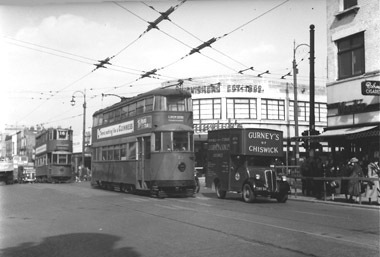 Tram services in Croydon ceased that month and it is to be another half century before a tram is seen at this spot again. As for 2133, it is sold to Leeds Corporation for another lease of life and becomes No 582 in their fleet, although it is not until five years later that it enters into public service once more on 31 July 1956 to become the very last Feltham to have a second life. The 16/18 timetable of 1951 shows it was a twenty-two minute ride to Purley from here with the service interval every ten minutes from five in the morning, right round until well past two in the morning the following day. Now that's what I call a public service! In contrast, the local 42 tram route ceased just after mid-night, obviously no one went on the town from Thornton Heath in those days. The trolleybus overhead seen in the picture is part of less than a mile of shared overhead between routes 630 and 654. The frequency of tram and trolleybus services should have created a photographic opportunity to have both types of vehicle in view at this junction but no such picture appears to exist. Other pictures taken at this road junction. Just to let you know I'm still pop in to see your remarkable site from time to time! I'm also still "saving" for [or praying for] a scanner that will reliably accept old-age negatives so that I can start producing prints/jpeg files from my collection of photographs. Recently I have found that local photo-processing shops can't handle anything but 35mm, so the situation is becoming somewhat alarming! Anyone with info/ideas on scanners for various size negatives? Nice to see that my dear old Feltham 2133 is still churning across the West Croydon crossing. Smart of you to have noticed the CROYDON destination. Did some of the 16/18's turn short - at Coombe Road? Acknowledgements are made to David Simpson <philobus@hotmail.com> and Geoff Bannister <Gbannister10@aol.com> who made the creation of this page possible. Picture 582 is from the LRTL [now LRTA] publication "Leeds Trams 1932-1959" by Andrew D.Young [c1970].